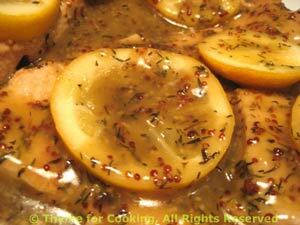 Turkey Cutlets with Honey and Lemon, Thyme for Cooking simple gourmet dinner. Thinly sliced turkey cutlets cook quickly. There are flavored with lemon, honey and mustard for a quick pan sauce. In medium nonstick skillet sauté the turkey cutlets until lightly brown on both sides. In a small bowl whisk together the mustard, honey and chicken stock. Spread onto the turkey slices. Place the lemon slices on top, cover, reduce heat and simmer 10 minutes.